Traditions are a big part of what makes the holidays so special for you and your kids. Here are 10 fun ones to start now, even if your baby doesn't quite understand what's going on yet! Even the littlest kids can help—we use that word in its broadest sense—decorate the Christmas tree. The adults should tackle the lights, then let babies and toddlers dig through the ornaments while older kids hang them up. Set the scene with holiday music, cookies, and hot (er, lukewarm for safety) chocolate. Dress your baby in holiday-themed pjs so she'll look adorable and festive during present opening (and photo taking) come Christmas morning. And why not buy matching sets for all your kids every year! Some parents give these as gifts on Christmas Eve—it motivates the kids to get ready for bedtime on a night where excitement (and aversion to going to sleep) tends to run pretty high. This one can be hit or miss, particularly with a baby or toddler. If your little one is up for it, a visit to Santa is a classic tradition that often yields some very memorable photos. You can sit on Santa's lap with your kids if that helps make it happen! Yes, it's commercial, but as a new entry into traditional holiday activities, the Elf on the Shelf is a winner that offers a daily activity for kids as well as a holiday message. You can buy the doll, book, and kit of this magical elf who, as the story goes, acts as Santa's eyes and ears in your home in the days and weeks leading up to Christmas. Check Pinterest for some amazing ideas on where to hide the Elf, who can be a great motivator for inspiring good behavior in older kids! Everyone, even babies, appreciates twinkly holiday lights, life-sized Rudolph figurines, and glittery snowflakes. Plan an annual family trip out to see the best displays in your neighborhood; bundling up your baby is part of the fun! Make it extra-special by inviting friends or finishing the night at a favorite ice cream or dessert shop. Mix up a batch of your favorite holiday cookies and drop them off at an elderly neighbor's house. 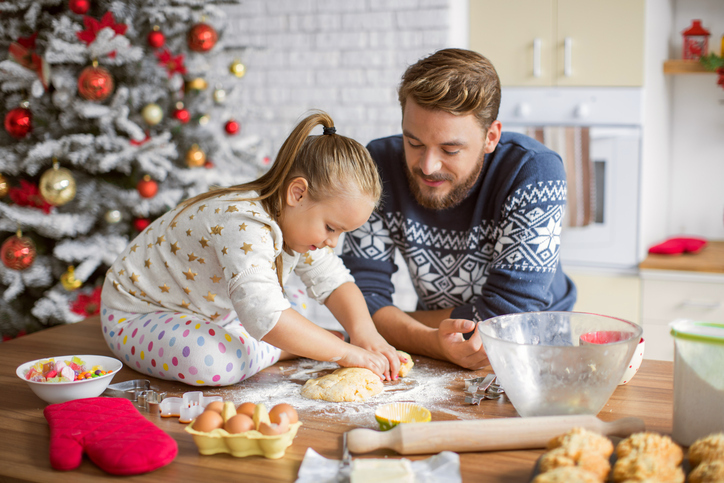 Your baby might not be much help in the kitchen yet, but she's sure to bring a little bit of joy into the house and heart of the cookie recipient. Read labels and go for raw nuts when possible. Many commercially available nuts are heavily oiled and salted—opt for low sodium, or salt-free versions when possible.Swap out your regular bedtime books with Christmas, Hanukkah, or other holiday stories. It will be fun for your little one to remember his favorite books from this time of year, and reading them will help everyone get into the season. Kids have a hard time waiting for the big December 25 to come around, so a countdown calendar is a fun and useful tradition to get started. You can buy a ready-made, chocolate-filled one at your local drugstore, search for one on Amazon, or craft your own. Fill each day's pockets with candy or special family activities and let the countdown begin! Teach your kids the meaning of the season through your actions, which speak much more strongly than words when it comes to charitable acts. Carry change and small bills in your pockets and let your little ones deposit it into the Salvation Army's red buckets whenever you see them. Help them pick out a toy and deliver it to a Toys for Tots drop-off location. Have your kids help you grocery shop or empty the pantry to stock a bag for your local food shelf. New Years' Eve takes on a whole new life when you have a baby. Start a new tradition by staying in and having a party with your kids and partner. Make some special treats to eat and fancy drinks to sip—don't forget the whipped cream!—put on some music and have a dance party, and then get the kids in their pjs and let them fall asleep watching a movie. Then snuggle up with your beloved and see if you can stay awake until midnight!